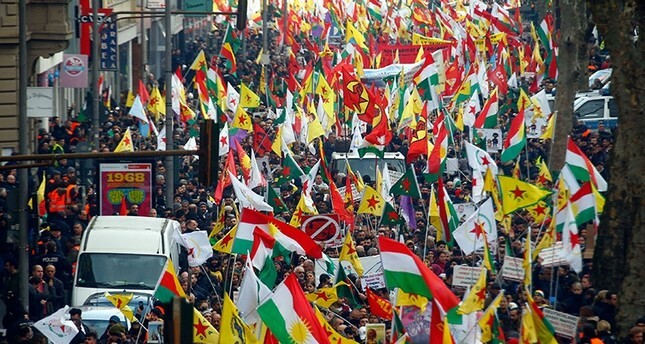 Hundreds of PKK sympathizers took to the streets of Cologne on Saturday in protest of Turkey's Operation Olive Branch in northwestern Syria, as German officials warned against tensions. The protest, which organizers expect to see up to 20,000 participants, comes a week after Turkish special forces and the Free Syrian Army (FSA) launched a counter-terror operation targeting PYD/PKK and Daesh terrorists in Syria's Afrin region. "Freedom for Kurdistan" and "Shame on you, Europe!" read some of the pro-PKK placards in the western German city. As the protest got under way, police put the number of demonstrators at 1,000, while an AFP journalist put the figure at several thousand. More than 2,000 police officers have been drafted in for the demonstration, including some from neighboring federal states, the head of the Cologne police force, Uwe Jacob, said on Friday. The protest was organized by NAV-DEM, an association deemed close to the outlawed PKK, which is blacklisted by Ankara and its Western allies as a terror group. The PKK has been banned in Germany since 1993, but it is still active with nearly 14,000 followers among the country's Kurdish immigrant population. Germany has a 3-million-strong Turkish community, many of whom are second- and third-generation German-born citizens of Turkish descent whose grandparents moved to the country during the 1960s. Operation Olive Branch is being carried out under the framework of Turkey's rights based on international law, U.N. Security Council resolutions, its self-defense rights under the U.N. charter, and respect for Syria's territorial integrity. Afrin has been a major hideout for the YPG/PKK since July 2012, when the Assad regime in Syria left the city to the terror group without putting up a fight.